Mar. 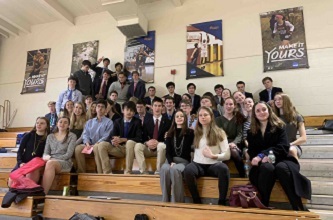 20, 2019: A group of Bronxville High School freshmen and sophomores earned the top prizes at the 2019 Lower Hudson Valley Regional National History Day Competition, which was held on March 9 at St. Thomas Aquinas College. The students, who have been conducting extensive historical research on a topic of their choice during the last several months, competed against students from seven other area schools. Their authentic work focused on this year’s National History Day theme of Triumph and Tragedy in History and is displayed in one of five ways--paper, website, documentary, performance, or exhibit. At the regional competition, a total of 54 students from Bronxville High School were interviewed by professors and scholars and articulated what they had discovered through their historical research. Of them, 41 students received top honors, but only first- and second-place finalists advanced to the New York State National History Day competition, which will be held on April 29 in Cooperstown, New York. Pictured here: Bronxville High School freshmen and sophomores who earned top prizes at the 2019 Lower Hudson Valley Regional National History Day Competition.